25 Mar 1948: USS Valley Forge (CV-45) operated in the Persian Gulf with Saudi Arabian Prince Ibn Saud embarked to view air operations. However, the air display was cancelled because of a sand storm and hazy conditions. 29 Apr 1948: Valley Forge moored port side to Dokkeskjaerkaien Dock, Bergen, Norway. The mooring was conducted without the aid of tugs, using the engine power of the squadron’s eight F8Fs spotted on the forward deck and eight other aircraft on the aft deck. The mooring operation was called Operation Pinwheel. 5 Aug 1950: The squadron participated in its first combat operations, flying sorties against targets in the Mokpo-Kwangju area of South Korea. 12-19 Sep 1950: The squadron participated in the pre-assault strikes against targets in and around Inchon, Korea, in preparation for the Inchon landing on 15 September. These strikes included road, rail, and airfield sweeps and Combat Air Patrol. During and after the invasion the squadron continued to fly daily air sweeps, striking at targets of opportunity and the enemy’s lines of communications. 10 Nov 1950: The squadron’s first encounter with MiG-15s occurred during a sortie over Sinuiju, Korea. One MiG-15 was damaged during the engagement. 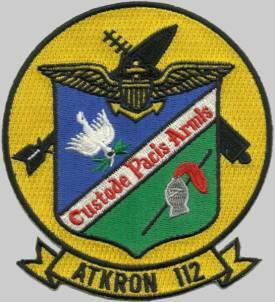 23-24 June 1952: The squadron participated in coordinated strikes against North Korean hydroelectric power plants, the first heavy attack conducted against these installations. 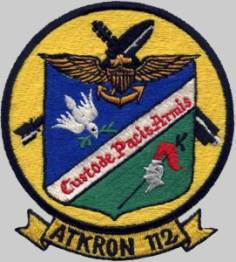 Nine different hydroelectric power plants were struck by forces from Carrier Air Groups 2, 7, 11, 19, and the 5th Air Force. 6-13 Feb 1955: The squadron was on station and available for air support during the evacuation of over 26,000 personnel from the Tachen Islands which had come under bombardment by the People’s Republic of China in January 1955. 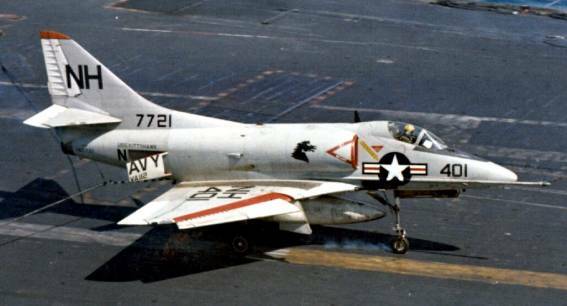 24 Apr 1967: Squadron aircraft participated in a multi-carrier coordinated strike against North Vietnam’s MiG base, Kép Air Base, northeast of Hanoi. 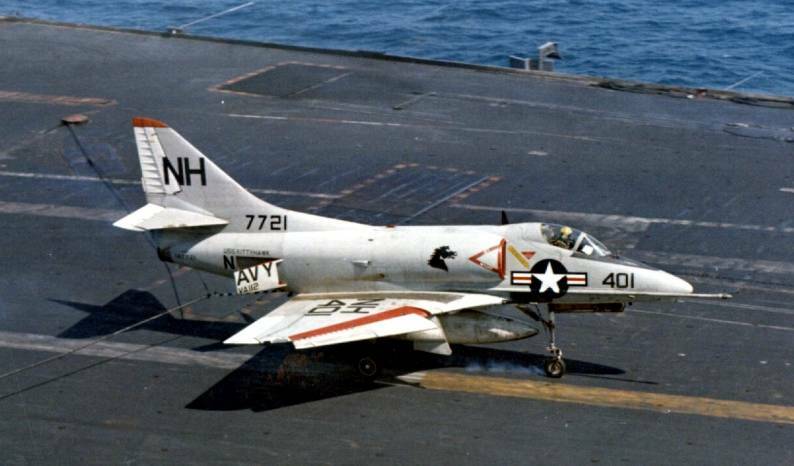 This was the first time a strike had been conducted against a North Vietnam MiG airfield. 10 May 1967: Commander M. L. Minnis, Sr., was awarded the Silver Star for action during a strike into North Vietnam against the thermal power plant at Haiphong. Apr 1969: Following the shoot down of a Navy EC-121 aircraft by the North Koreans, USS Ticonderoga (CVA-14), with VA-112 aboard, along with two other attack carriers, was ordered to the Sea of Japan.